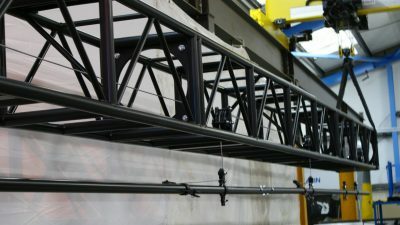 A truss mounted, fully integrated lighting bar and winch system rated for loads of 125kg and 250kg and with up to 6 lines. Ideally suited for small studios, theatre and school applications the Integrated Lighting Bar Winch was designed and built with both safety and value in mind. Our lighting bar winches are fitted with an integral safety gear within the gearbox, ensuring a safe arrest of the load in the unlikely event of main drive gear failure. When the secondary safety gear is engaged, it locks the drive shaft preventing the load from dropping. We have designed our Integrated Lighting Bar Winch to create a robust lighting bar solution. 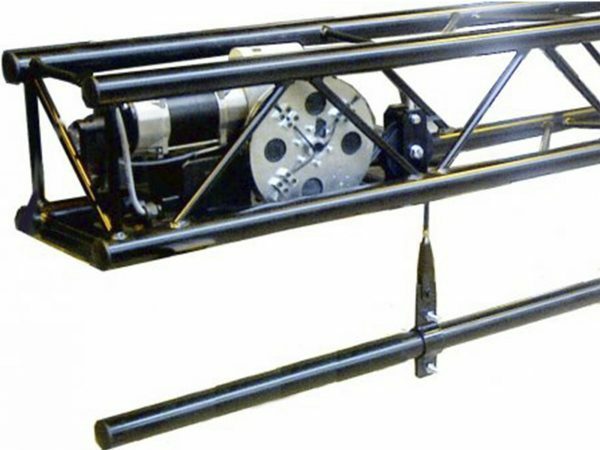 The system features our Pilewind Winch which is integrally mounted inside a stick of either 30cm or 52cm BASICS truss, which has no internal diagonals. The standard lighting bar winch can accommodate safe working loads of 125kg and 250kg, but we can also manufacture our Integrated Lighting Bar Winch for load capacities of up to 990kg upon request.